Struggling with student debt? You’re not alone. As of 2018, approximately 44.2 million people owe more than $1.5 trillion in student debt—and the average debt load from the Class of 2016 is about $37,172. Approximately 70% of college graduates leave school with at least some debt. Refinancing is a “do-over” button for your student loans. When you refinance, you get a new interest rate, new terms, and a new lender. Millions of people have reduced their monthly payment by refinancing or have saved thousands in interest over the life of their loan. Refinancing your federal student loans means erasing those loans and replacing them with a private loan. There’s a big benefit to refinancing your federal loan with a private lender—and that’s landing a lower interest rate. Some federal student loans have interest rates at 7% or higher—and while those rates don’t go up with market fluctuations, they also don’t go down. Refinancing is one of the few ways you can reduce your interest rate on a federal loan. If you’re considering federal student loans, here are the steps you should take. Student loan forgiveness, such as through Public Service Loan Forgiveness (PSLF). Guaranteed death and disability discharge. Keep in mind that some federal benefits—such as loan forgiveness—may not be applicable to you. Some private lenders do offer flexible repayment options including deferment or forbearance if you experience economic hardship. If those protections are important to you, it’s a good idea to look into the options a private lender offers. The next step is to see what interest rate you can get from private lenders. 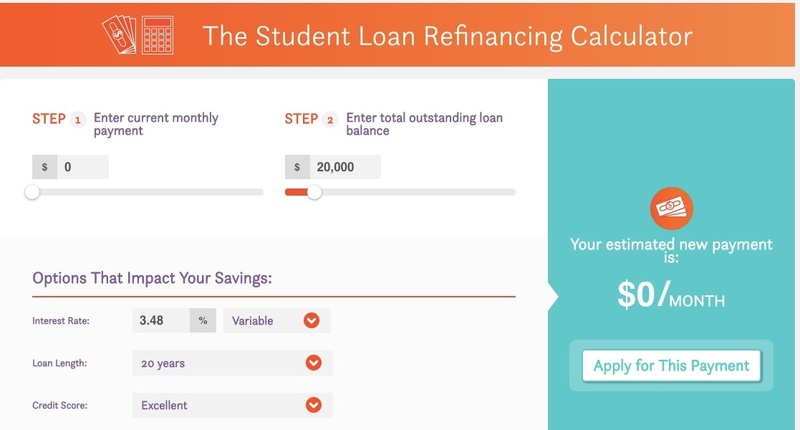 Most private lenders offer a student loan calculator that lets you input general info about your finances—and will give you a ballpark estimate about the interest you could save. (Here’s ours—it gives you estimates from several different lenders all at the same time). Once you’ve picked a short list of lenders, it’s time to get a more specific quote. Fill out an application—this usually takes about 15-20 minutes. At this stage, most lenders will do a “soft pull” on your credit, which won’t show up on your score. A recent pay stub from your employer. Billing statements from the student loans you’re looking to refinance. A driver’s license or passport. Once you get offers from several different lenders, pick the one with the best rates and terms. They’ll then do a “hard pull” on your credit score and offer final approval. This process may take anywhere from a few days to a few weeks, depending on whether the lender requests additional information from you. Once you’re approved for refinancing, the private lender will pay off your federal loans in full and issue you a single new loan, with a new interest rate. Your former federal loan servicer(s) should notify you that your existing loan with them has been closed. Important: Be sure to continue making payments on your old loan until you have confirmed that it has a zero balance. Otherwise, you could find yourself accruing penalties by accident. If you have private student loans, refinancing is a little more of a no-brainer than it is with federal loans. When you refinance a private loan, you’re not losing federal protections. That means if you're able to score a lower interest rate with a different private lender, you have a powerful incentive to do so. Even lowering your interest a little bit may save you thousands over the life of your loan. The interest rate they offer. Flexibility and protections for economic hardship. A record of ethical lending practices. Once you’ve narrowed it down to your four or five top lenders, fill out their applications. Because most reputable lenders do not charge an application fee, you might as well take the opportunity to shop around for the best rate. This process usually takes about 15-20 minutes per lender and requires some documentation—including a pay stub and a billing statement from the loans you’re refinancing. The lender will do a “soft pull”—this won’t affect your credit score—and give you an initial offer. Once you’ve chosen an offer, let the lender know you’ve accepted. They’ll then have to formally approve you—and do a “hard pull” on your credit in the process. This may take a few weeks if the lender requires additional documentation, but often you’ll have a solid answer within a few days. Once you accept the offer, your new lender will handle all the paperwork to transfer your existing loans over and issue you a single new loan. Remember, keep paying on your old loan until you’re certain that it has a zero balance. The main benefit of refinancing is scoring a lower interest rate. Some private lenders offer rates as low as 2.47%—a better rate than most current federal loans. Bear in mind, though, that even a small interest rate reduction can save you a lot of money. Let’s say you have $35,000 in student debt—a little less than the national average of $37,172 for the Class of 2016. And let’s say you’re paying it off over 15 years, with an interest rate of 4.5%. An interest rate reduction of 1%—down to 3.5%—would shave off $3,157 in interest over the life of your loan. A 2% interest rate reduction saves you $6,187. Some lenders offer additional interest rate discounts for certain things. A 0.25% rate discount for enrolling in AutoPay is pretty standard. CitizensOne offers an additional 0.25% discount on your interest if you open a bank account with them. One of the best ways to score a lower interest rate, however, is to raise your credit score over time. If your credit score is in the 650-850 range, you’re a very valuable borrower—and banks are likely to offer you their best rates. If your credit score wasn’t as good when you opened your loan as it is now, you stand a very strong chance of getting a particularly large reduction on your student loan interest if you refinance. Same if you have federal loans—especially if you’ve opened them recently. The Direct Student Loan interest rate is up to 5.05% as of July 1, 2018—a 13% increase from the previous year. That’s more than twice the interest rate offered by some private lenders. If your federal loan is recent and your credit score is good, you could also benefit from refinancing. There are plenty of choices when it comes to refinancing your student loans. Here are some things to consider when you’re selecting a lender. This is the most important factor for most people. Get a ballpark idea by using the lender’s online calculator—most have them. (Ours is here—it gives you estimates from several different lenders). You can do this before you fill out an application. Offering access to over 13,000 community and nonprofit lenders with low interest rates (LendKey). Looking at your earning potential as well as your FICO score when determining your interest rate (SoFi). Negotiating aggressively with a large network of partner lenders to score lower rates (Splash Financial). Offering a hybrid loan that combines the stability of a fixed interest rate with the lower rates of a variable loan (CommonBond). How good is it? What are people saying about them in online reviews? You’ll be living with this new lender for a while (unless you refinance again), so be sure it’s a relationship that won’t cause you headaches. Some lenders—like SoFi and Laurel Road—have award-winning customer service and experienced representatives. Some private lenders offer borrower flexibly—such as deferment or forbearance for borrowers facing economic hardship, interest-only payments for a set period of time, or loan forgiveness due to death and disability. This is an especially important consideration if you’re refinancing federal loans with a private lender, as you lose federal protections that are mandated by law. Whether you qualify for any type of loan assistance is often at the discretion of the lender. It can help to look for a lender that offers formal programs and policies that provide some protection. A significant commitment to social responsibility—funding the education of kids in developing countries (CommonBond). Career counseling, coast-to-coast networking events, and entrepreneurial seed funding (SoFi). Specialized programs for people with debt from medical and dental school (Splash Financial and Laurel Road). What are the pros and cons of refinancing student loans? Refinancing can bring big benefits—but there are also some drawbacks to consider. Here are the key things to think about. When you refinance a student loan, a private lender pays off your old loan—and issues you a new one with a new interest rate. Ideally, that interest rate will be lower than before. No two lenders will give you the exact same offer. When your credit score is better now than when you took out your original loans, if you’re refinancing private loans. When private lenders offer interest rates lower than federal interest rates. Many federal student loans have higher interest rates than the lowest rates offered by private lenders. The current rate for undergrad Direct Student Loans as of July 1, 2018 is 5.05% (up 13% from last year). Older loans have lower interest rates. But private lenders are offering interest rates as low as 2.47% on the low end. If you have good credit and can score a rate that low, you could save thousands by refinancing your federal loan with a private lender. The government has its own semi-equivalent to refinancing with a private lender for federal loans: consolidation. But with this option, you don’t get a lower interest rate; your rate is determined by taking the weighted average of interest rates on all your loans, and rounding up by 1/8th of a percent. So yes, you read that right. Sometimes when you consolidate with the federal government, you interest rate may actually go up. Another good thing about refinancing is that you can reset the length of your loan. Stretch it out longer and you can lower your monthly payment. Make it shorter, and you can pay it off faster—and save a lot on interest. If you’re like many people, you have a number of federal and private loans with different lenders and servicers. This can present real logistical difficulties in keeping track of your loans, making on-time payments, and even knowing how much you owe. Refinancing replaces multiple loans with a single loan—so it’s much easier to keep track of payments and payoff timeframes. You only need to pay one lender, and you can easily see the status of your loan at a glance. The biggest potential drawback to refinancing federal loans is that you lose certain protections that are mandated by law. These include deferment and forbearance options, death and disability forgiveness, and income-driven repayment. CommonBond offers the CommonBridge program, which will let you postpone monthly payments for up to 12 consecutive months. You can put your loan in forbearance for 24 months total over the life of your loan. They’ll also help you land a new job. SoFi also helps you land a new job—with extensive career counseling, resume evaluation, and networking programs for its borrowers. They offer deferment for grad students, active-duty military members, and those undergoing rehab for a disability. Laurel Road offers up to 12 months of forbearance for economic hardship, plus forgiveness in the event of death or permanent disability. College Ave will let you pay only interest for the first two years of your loan. If you’re worried about losing protections when refinancing a federal loan, you should talk with lenders about their hardship programs before making a decision. Another drawback to refinancing is that, when you refinance federal loans, you lose access to programs such as Public Service Loan Forgiveness. This program forgives your loan after about 10 years of qualifying payments—but it’s notoriously picky, even if you work for a qualifying employer. If you work in public service, it’s a good idea to do your homework sooner rather than later to make sure you’re on track to qualify. If not, it may be worth it to see if you can score a lower interest rate through refinancing. If you enroll in income-driven repayment, you could also be eligible for forgiveness (of your federal loans)—after a period of 20-25 years, depending on the program. You lose access to that option as well if you refinance a federal loan. This is a pro if you have a good credit score. If you don’t, you may be better off sticking with the interest rate on your federal loan. Lenders look at factors such as your FICO score, your earning potential, your degree, your income, and other factors when determining the interest rate to offer you on your refinanced loan. As with any other loan, such as a mortgage, you’re not guaranteed a good interest rate. If you’re not sure how good of a candidate you are, it couldn’t hurt to fill out applications with a few of your top lenders. There’s no obligation to accept the offer, and most lenders will do a “soft pull” for your initial offer, which affect your credit score. If the numbers aren't in your favor, spend some time improving your credit score and then reapply in a few months. Private lenders offer a range of interest rates. Just to give you an idea, here is a quick snapshot of the top lenders. For a more detailed report click here to quickly view the current rates from our top-pick lenders. Refinancing is better for some people than others. Take our 7-question quiz to find out if it’s the right decision for you. Once you’ve narrowed it down to a short list of lenders, you can fill out an application and get an initial quote. Most lenders do a “soft pull” during this process that doesn’t impact your credit score. Once you get an initial offer, you can make a side-by-side comparison to determine which lender has the best interest rate, terms, and monthly payment. Once you accept your top lender’s offer, they will need to do a “hard pull” on your credit and approve it. This process may take anywhere from a day or two to several weeks. Once you’re approved, your new lender will handle all the paperwork to pay off your existing loans and issue you a new loan. You should receive notice from your previous servicers or lenders that your loans have been paid off in full. Refinancing can save you thousands over the life of your loan—and hundreds of dollars in your monthly payment. Find out how much you could save. Can anyone refinance student loans? Why should I refinance my private student loans? Why should I consider refinancing my federal student loans? What do I need to get approved to refinance my student loans? How will refinancing affect my credit score? Am I paying too much for my student loans? How do I apply for student loan refinancing? When will I start saving money? When you refinance your student loans, you pay off your existing student loan debt by taking out a new loan, generally with a different lender. The new lender purchases your old debt and then provides a new loan with new terms. For many graduates, refinancing results in lower interest rates and lower monthly payments. It can also provide an opportunity to extend your repayment term, which can further reduce your monthly payments. If you have a good credit history and stable employment, you’re probably a terrific candidate for student loan refinancing. But even if you’re not a ready-made candidate for refinancing, you may still be able to refinance with a cosigner. Your credit score is a numerical representation of your credit history. If you have a score between 690 and 850, you will likely be in a good position to refinance. Your debt-to-income ratio tells banks how much money you’ll have available each month for payments. You can calculate your ratio by adding all your monthly debt payments and then dividing by your gross monthly income (what you earn before taxes). Banks are typically interested in a number less than 36%. Your credit score is tied to your repayment history. Banks look for low-risk candidates—people who’ve made timely payments on bills, credit cards, and student loans. Candidates with full-time jobs have more success refinancing their student loans. Lenders see an applicant with a steady job and income as more likely to pay back their loans. If you’ve already graduated from college, refinancing might be a good option. Banks approve borrowers who have graduated at higher rates than those who have not. Applicants that meet these criteria have a better chance of getting approved for refinancing. Both consolidating and refinancing your student loans may allow you to stop making multiple payments to different lenders each month, but the two processes work in different ways and have varied benefits. With student loan consolidation, you combine multiple student loan payments into a single monthly payment and eliminate the need to keep track of several payments or balances. You may also see a reduction in your monthly payment if consolidation allows you to pay off your balance over a longer period of time. But consolidating loans doesn’t always mean you pay less. In fact, if you’re consolidating federal loans through a Direct Consolidation Loan, your interest rate may go up slightly because your combined interest rate average will be rounded up. And if you extend your loan term, you may end up paying more over the life of the loan. Refinancing, on the other hand, typically saves you a lot of money. With student loan refinancing, you take out an entirely new loan to pay off your existing student loan or loans. You may consolidate multiple loans in the process, but you can also refinance a single loan or previously consolidated loans. Refinancing will allow you to reduce your interest rate and lower your monthly payment at the same time. You’ll save money every month, as well as over the life of your loan. People who refinance their student loans are often able to lower their monthly payments by $250 a month or save over $16,000 over the life of the loan. How can refinancing create such staggering savings? Interest rates may have dropped since you took out your original loans, or you may have built up your credit in the years since graduation, making you eligible for a reduced interest rate and better loan terms. If you have federal loans, you have a standard fixed interest rate that’s the same for all borrowers regardless of your financial profile. This rate is often higher than what private lenders can offer because it has to account for high-risk applicants who are more likely to default or not finish their degrees. Refinancing with a private lender that considers your specific financial circumstances could result in a lower interest rate. See: Refinancing Student Loans: How Much Could You Save? A new car note or a childcare payment could be the push you need to refinance and start saving some cash each month. For people with interest rates of 6.5 percent or higher, refinancing will likely result in lower interest rates and monthly savings. Lenders look for borrowers they trust to repay their loans, and a strong credit score is a positive indicator. If you don’t have a great score (690-850), a cosigner could help. A low debt-to-income ratio assures lenders that you’ll have money in the bank each month to pay your loan payment. If you have a ratio between 20 and 36%, you’re in a good position. To calculate your ratio, add all your monthly debt payments (car payment, student loan payment, credit card payment) and divide that by your gross monthly income—what you earn before taxes. Lenders have more confidence in borrowers who have full-time, steady employment, so if you’re bringing in a regular paycheck, you’re likely a better candidate for refinancing. If you’re considering refinancing your student loans, taking a close look at your finances can help determine whether now is the right time for you to apply. Refinancing your private student loans is a big decision, and only you can determine whether it’s right for your particular financial situation. But there are a few factors that can help you decide. You may be able to get a lower interest rate by refinancing, especially if you have improved your credit score and repayment history since you took out your original private loans. Getting a better interest rate on your student loans means you can lower your monthly payment even if you keep your repayment term the same. You could also reduce your payment even more by spreading the repayment period out over a longer time frame. Your financial circumstances are unique to you, and most companies that refinance student loans allow applicants to choose a repayment timetable that meet their particular situation. You will likely be able to choose from a term between five and 25 years. Refinancing allows you to combine multiple loans into a single monthly payment. You’ll be able to keep better track of what you owe and be more likely to avoid missing a payment, which could hurt your credit score. The application process for student loan refinancing is streamlined and often takes less than 15 minutes. If you took out college loans before 2014 or are paying more than 4% interest, you are most likely to benefit from refinancing your student loans. There are no inherent downsides to refinancing your private student loans, but look carefully at the terms of any new loan to ensure you are getting a deal that makes the most sense for your finances. If you choose to lower your monthly payment by extending the repayment term, you will end up paying more interest—and thus more money over the life of the loan—than if you stuck with a shorter repayment term. Very low interest rates—and the resulting very low monthly payment—can look great when you are refinancing. But be careful about focusing on short-term relief and ignoring long-term implications. An interest rate that suddenly increases in a few years could put you in a difficult situation if you’re not prepared. Many of the same advantages you’d get from refinancing private loans apply to federal student loans as well. If you refinance your federal student loans with a private lender, you could benefit from lower interest rates and lower monthly payments—especially because federal loans follow a “one size fits all” fixed interest rate approach. With refinancing, you may be able to get a lower interest rate based on your own good credit scores, a cosigner’s strong credit, or assets like home equity. Also, refinanced loans often have the option of fixed, variable, or hybrid interest rates. You could also consolidate multiple loans into a single monthly bill or change the length of your repayment term. However, if you have federal loans, there are specific questions you’ll want to ask yourself before refinancing. Will I lose needed benefits? Refinancing removes your eligibility for federal income-driven repayment options. If you have a low or unsteady income, are currently unemployed, or are changing careers, you may consider waiting to refinance until your financial condition improves. Could my loans be forgiven? People who refinance federal loans lose access to any benefits related to Student Loan Forgiveness. If you are a federal employee, a teacher, or you work in a public service field, you could qualify for student loan forgiveness after 10 years of consistent payments. Refinancing removes that option. As with private loans, you’ll likely have the option to extend your payment term or take a new loan at a variable interest rate. Make sure you consider the long-term impacts of these decisions. See: Should You Refinance or Consolidate Your Student Loans? You can probably gather the materials you need and fill out the online application to refinance your student loans in less than an hour. The most recent loan statement for each loan you want to refinance. Make sure it shows your loan servicer name and address as well as the repayment start date, an estimated payoff date, the original loan balance, the current loan balance, the interest type, and the interest rate. A driver’s license, passport, or bank statement that can be used to verify your address. To make a decision about your loan, the bank will review your application and check your credit score. A score above 690 is considered good. In your paperwork, the lender will look for evidence of a low debt-to-income ratio, solid repayment and employment history, and a college degree. Lenders want to provide loans to people they’re confident can pay back the debt. Each of these criteria helps a bank determine whether you’re a good candidate for a loan. Applying to refinance your student loans could have a slight negative impact on your credit, but if you do refinance, you may ultimately improve your credit score. Your credit score is based on your payment history and the amount of debt you have. The credit bureaus that determine your credit score consider potential new debt, reports of debt being sent to collections, and how long you’ve had credit. When you’re shopping for a new lender, your score might drop by a few points because each time a lender checks your credit, your score takes a small hit. You can minimize the impact by limiting your comparison shopping to a 15-day timeframe and by filling out a full application for only the best offers. Find out everything you can before you apply. The small hit to your credit score may be worth it in the end if you do end up refinancing. On-time payments are the most important factor in how your student loans are treated in your credit score. If refinancing means you have a lower debt-to-income ratio and are more able to consistently make on-time payments, then refinancing could ultimately improve your credit and increase your credit score. If you could choose to pay less on your student loans, you definitely would. So how do you know if that’s an option? You can quickly and easily compare the terms of your current loan to the terms you’d have with a refinanced loan by using our Student Loan Refinancing Calculator. Chances are if you’re paying more than 4% interest, you could have a lower interest rate—and a lower monthly payment—if you refinance. With all the options out there, choosing a lender can feel pretty overwhelming. But don’t worry. With a few simple steps, you can make a well-reasoned decision. Give yourself a time limit. You’ll get a ding on your credit score each time a lender performs a credit check, but keeping all your inquiries within a 15-day period can limit the impact. A shorter time frame also means interest rates are less likely to change while you’re shopping. Make strategic choices. Find out as much as you can about each lender’s expectations and terms before you apply. This will help you minimize credit hits and will ensure you don’t waste time applying to a lender that isn’t a good fit. Contact lenders. Call the lenders you’re considering and see what their customer service is like. Once you refinance with a bank, you’ll have a long relationship with them. Make sure you like how they work. If you’ve decided refinancing your student loans is right for you, start by performing an initial inquiry with at least three different companies. This informal step is not the same as a full application and will not affect your credit score. Once you’ve gotten the information—including interest rate, terms, monthly payments, and total loan payment—from several companies, compare the results side-by-side. Consider what your monthly payments will be and how much you’ll pay over the life of the loan. Information about your loans, including loan amount—both original and current, interest rate, servicer name and address, and payoff date. Your driver’s license, passport, or a bank statement to verify your address. Follow the prompts of the online application and upload documents where necessary. Once your application is approved, you’ll likely start saving money within three to four weeks. That’s about how long it takes your new lender to pay off your old loans and request the first payment. One word of caution: don’t stop making payments on your old loan until you receive an invoice from your new loan servicer. Refinancing your student loans can feel intimidating, but we’re here to help. Use our our 10-second Refi Ready tool to see how much you could save.